By now, most leaders and employees are used to getting lots of different functionalities from their technology. You can make calls with your smartphone, for example, but you just as easily could check your email or snap a photo. And similarly, most of the best apps let companies handle multiple jobs, too, such as a time tracking program that also allows you to generate bills and invoices. But the attitude that multifunctionality is a rockstar severely lags when it comes to more traditional physical office assets. While most people have heard of Google’s famous, purpose-specific nap pods, for example, most workers aren’t able to access nap desks, which give workers a comfy place to snooze under their normal workspace. Copy holders usually never do anything but hold paper, supplies are scattered in individual containers everywhere, and workers are fortunate if they even can get their chair to adjust to the right height and depth, let alone have their seat do something like charge their tablets. The result is a dramatic, rotting cornucopia of unnecessary waste — in the United States, businesses toss a whopping 17 billion pounds of physical assets into landfills each year. The problem likely is fueled in part by the fact leaders have become somewhat conditioned by rapid technological change to a mindset of dispose and upgrade. At the same time, companies tend to associate innovation only with the tools they use for developing their own products or services, not the everyday “essentials” like pen cups. Even if sustainability weren’t a major concern for companies, the lack of durable, multifunctional designs is worrying because of its influence on productivity. Having lots of different products can clutter work spaces, making it harder to focus and find what you need. Stealtho, LLC, a Ukrainian company, is one business taking serious note of the design problem. Their main goal is to create products that not only reduce how many office items with a harsh environmental footprint are out there, but that also improve workflow and efficiency. 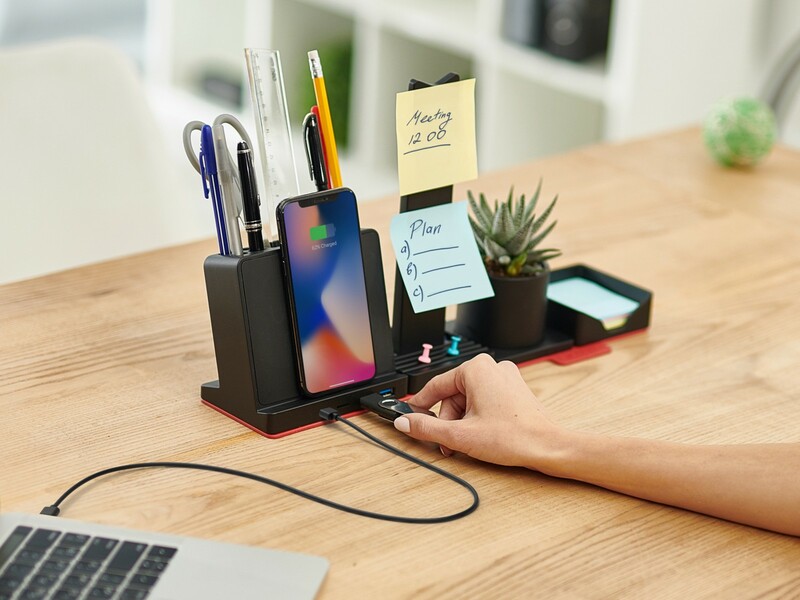 One of their latest products, for example, is a desk organizer that can charge devices, hold papers and headphones, serve as a message board and more. As Stealtho demonstrates, it’s more than possible to come up with solutions that pull heavy weight. But executives have to let go of biases they have about what an office has to be or look like if they want to streamline with more “in one” products. The unique needs and vision of the business should dictate specific products and setups, rather than companies trying to center heir processes around products that don’t really fit. Wanda Thibodeaux is a freelance writer and columnist with Inc.com. Since 2006, she has specialized in web articles and online content.